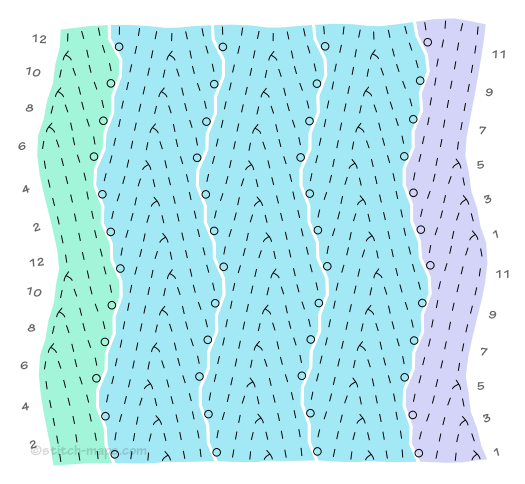 Yes, yes, you can knit from stitch maps. They’re instructions, just like any other chart. But beyond that – and perhaps more importantly – they’re visualization tools, the means of seeing how the parts of a stitch pattern fit together. Which is why I’m so excited to announce Stitch-Maps.com’s newest feature. See this? The “Sections” checkbox below “Column guides”? It now appears on every stitch pattern’s detail page. Click the “Sections” checkbox and the stitch map on display will go technicolor. 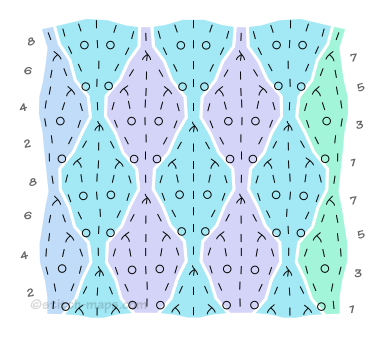 Each of these colored bits highlights a “section” of the stitch map, a series of stitches connected together via decreases, cable crosses, clusters, or gathers. Stitch markers placed between sections would never get caught in a decrease; they’d never need to be shifted out of the way of a cable cross. 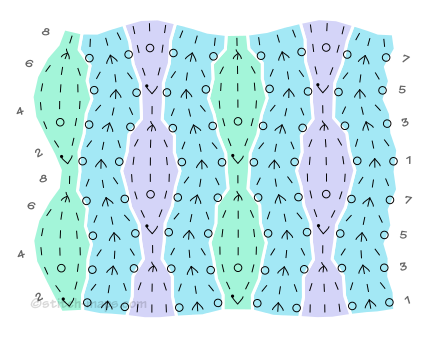 Equivalent sections are colored the same, letting you see repetition within the pattern. 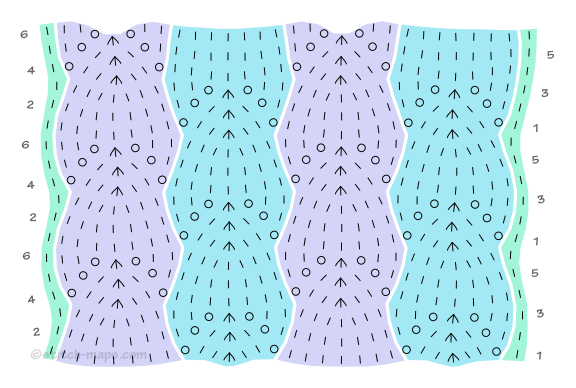 This isn’t quite the same as showing the stitch pattern’s horizontal repeat. But it can make the repeat easier to discern. Take Ostrich Plumes, for example. 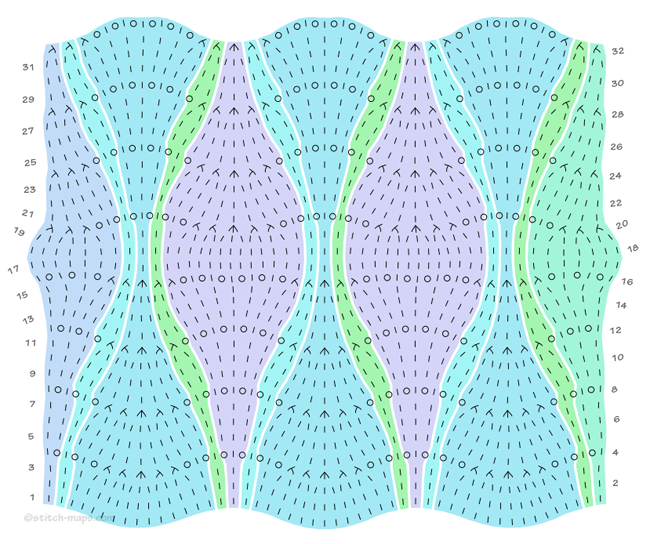 It’s fairly clear that the repeat consists of a lavender-colored section and three neighboring blue and green sections. Granted, having sections on display isn’t all that exciting for some stitch patterns. 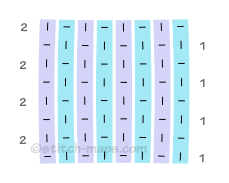 For example, knit/purl patterns like seed stitch have simple sections, all one stitch wide. 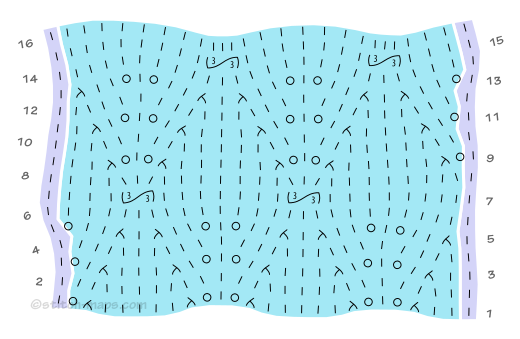 At the other end of the spectrum, some lace or cable patterns form lattices. 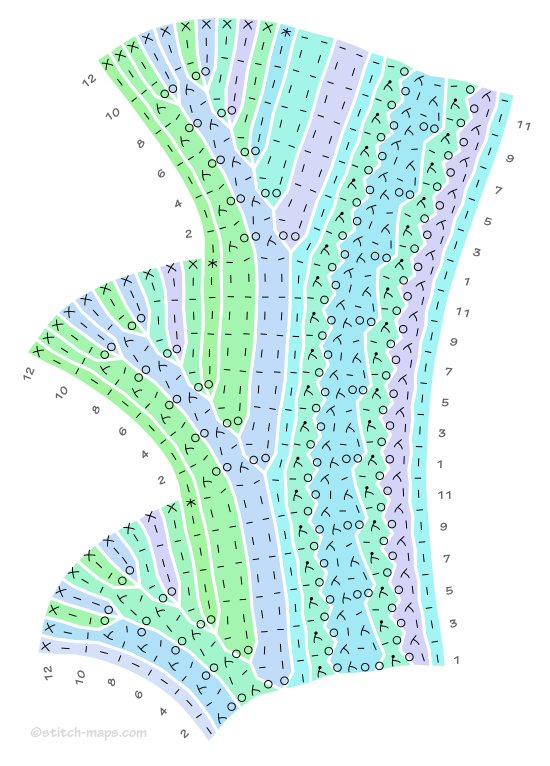 All of their stitches are interconnected into one giant section, as shown here with Lilac Leaf. But I still think sections make fabulous visualization tools. Consider this: viewing a stitch pattern’s sections could help you see the design elements of the pattern that could be removed, replicated, or replaced. 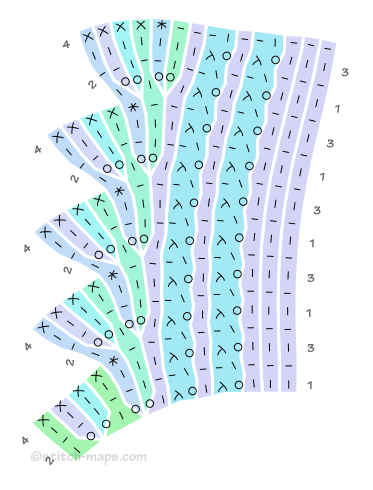 For example, with Dayflower, could the plain k2 columns shown in green be replaced by something more interesting? With Loop Edging, might we want more or fewer of the eyelet columns shown in blue? Or something else entirely? With Dewdrops, wouldn’t it be fun if the dewdrops shown in purple and green were wider? I hope you enjoy this new tool as much as I do. And subscribers: you can enable section display by default in your preferences. As always, if you notice anything funky with this new feature, or even if you just want to chat, please speak up!